With the exception of Joe Manchin in West Virginia, all of the incumbent Democratic Senators in red states either lost, or are slightly behind, in their races. 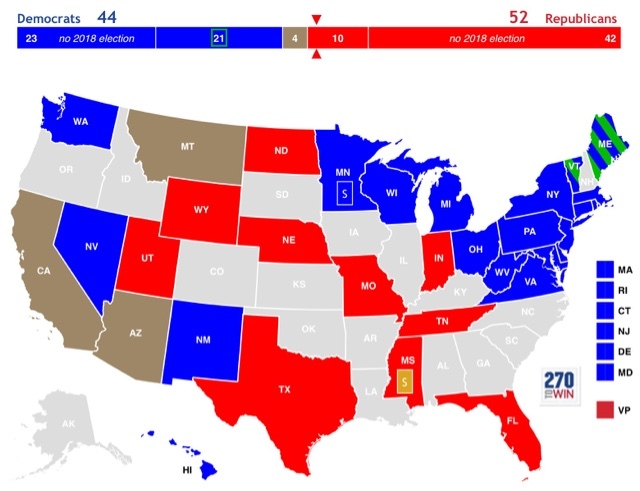 The blue vs. red re-alignment is nearly complete in the Senate. This is going to be an ongoing problem if the GOP remains the party of old white rural people, since rural states are vastly over-represented in the Senate. Three of the New England staes, plus Maryland, elected GOP governors. Meanwhile Wisconsin, Michigan, and Illinois returned to Democratic governors. 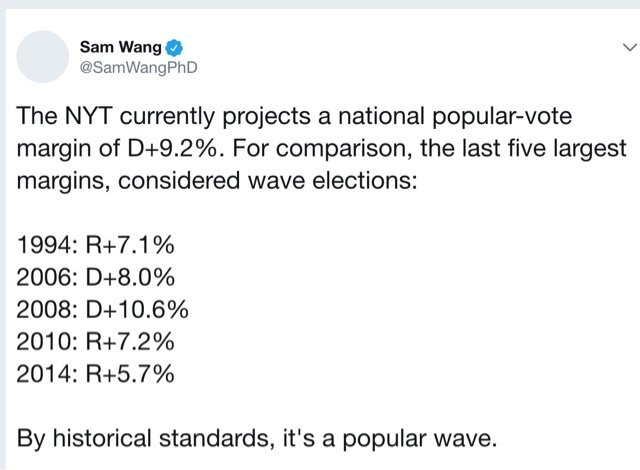 I expect the true 2020 battlegrounds to be the 3 "blue wall" states that have possibly returned to the fold, plus North Carolina, if that state's Supreme Court, now controlled by Democrats, throws out the GOP's gerrymander on state Constitutional grounds. 4. Florida is red. Virginia is blue. Democrats keep losing close races in Florida, because the influx of old, white retirees from the midwest to the Gulf coast outweighs the growth of the minority vote. It's possible that felon re-enfranchisement will make up the difference, but I'm not holding my breath. Meanwhile the Democrats have both Senate seats, the Governorship, and 3 more House seats in Virginia. Last year they roared back to a tie (minus one vote!) in VA's lower state house. If they pick up the upper chamber next rear, Virginia's re-alignment will be complete. 5. White voters lie about their intentions when an African-American candidate is running. In both Florida and Georgia, the black candidate came in 3%-5% under their polling. I do not believe that was an accident. 6. Finally, beware the lame duck "smash and grab"
Like jewel thieves making a quick getaway, I expect the GOP to inflict as much damage as possible on the budget, Medicare, Medicaid, Social Security, Obamacare, and anything else they can get their hands on, between now and December 31, figuring that voters will forget by 2020. It's going to be bad, so brace yourself. And now, back to the boring economy. 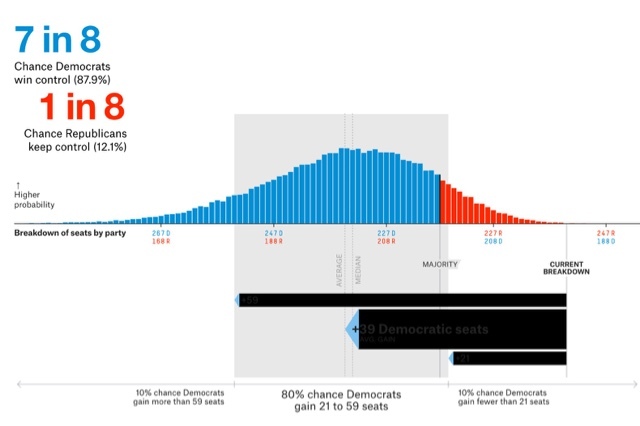 Previous Live-blogging the 2018 Democratic ripple? Wave? Tsunami?